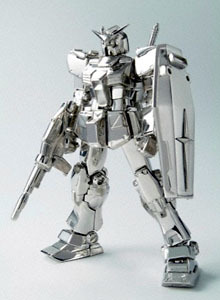 Bandai and Ginza Tanaka have teamed up to create a Mobile Suit Gundam made from pure platinum. Called Gundam Fix Platinum, the 12.5-cm (5-in.) tall, 1.4-kg (3-lb.) work features 89 separate parts and a head adorned with a 0.15 carat diamond. Hajime Katoki, a mechanical designer and illustrator noted for his work in a range of anime and games, oversaw the two-year long production process. According to the Bandai press release, the aim of the platinum Gundam masterpiece is to combine the pure, rare and eternal nature of platinum with the everlasting Gundam worldview. While Ginza Tanaka hopes to attract attention to the beauty and value of platinum, Bandai hopes to boost Gundam's name recognition around the world, nearly 30 years after the first anime episode aired on Japanese TV. The platinum Gundam will be exhibited at BASELWORLD 2007, an annual watch and jewelry show held in Basel, Switzerland beginning April 12. After that, it will return to Japan. There are currently no plans to sell the Gundam, but Bandai estimates its value at $250,000 (30 million yen). What exactly is the "gundam world view" anyways? Does that mean that Tiffany Japan will be making platinum Gundam pendants? I'm also curious about the "Gundam worldview." Does a platinum action figure really communicate "War is hell, but it is also GLORIOUS!" to the masses? LOL Madeline! I believe the Gundam world-view is shaped by the struggle to remain human in the face of dehumanizing forces inherent in a future of permanent mechanized space warfare. Precious platinum, while not Gundanium alloy (the ultimate Gundam material), is a fair choice of medium for this message. Platinum might not fully communicate the atrocity of war, but it does evoke images of oppression with its fat cat mining companies known for stealing and pillaging the ancestral lands of tribal societies in the name of profit. We can only hope the Gundam figure's crown jewel is an authentic "conflict diamond", the trade of which has contributed to conflicts and civil wars that have killed three million people in Africa. Yes, the extravagant materials of this figurine might actually capture the essence of the Gundam world-view. Where can I buy one? I think the complete 'Gundam World View' could only reach perfect authenticity if the figurines eyes were forged from shiny Blood Diamonds. Could this be a shorter version for MG 100 ? testing, testing, I do? - ohkate!